After Grant McVicar finished service with the Navy in World War Two he returned to Seattle and went into business with his father. The McVicars rented a brand-new storefront on the west side of 35th Ave NE between NE 85th and 86th Streets. McVicar Hardware operated 1946 to 1986, thriving in the climate of the post-war housing boom with young families fixing up their homes and yards in Wedgwood. The Wedgwood neighborhood took shape during the post-World-War-Two era of rapid housing growth. Albert Balch had started building small family homes in what he called the Wedgwood development, though he did not intend deliberately to name the whole neighborhood “Wedgwood.” With no other definite neighborhood name, businesses began calling themselves Wedgwood and then the name spread to churches and was also chosen for the new elementary school. Business block in Wedgwood on the west side of 35th Ave NE from the corner of NE 85th to 86th Streets. The present Wedgwood Ale House is in the center. McVicar Hardware was in the storefront space at left. In the 1920s the Shauer family had their house, a small store and a gas station on this block. Photo by Valarie. The growing residential neighborhood in the 1940s and 1950s created an ideal climate for shops to come in to serve the community at its commercial center on 35th Ave NE at NE 85th Street. The property owner on the west side of that block was Mr. Hansen, who owned the tavern at 8515 35th Ave NE. In 1945 the tavern, which had been called Hansen’s, was one of the first businesses to change its name to “Wedgwood.” Mr. Hansen saw the neighborhood growth that was coming so in 1946 he built the commercial building next to the tavern’s south side, corner of NE 85th Street. Mr. Hansen owned the entire length of this block from NE 85th to 86th Street, which had been a business block in the 1920s. At the close of World War Two Grant McVicar spent nearly a year in the hospital recovering from war injuries. He got out in 1946 and his father, wanting to help Grant get back on his feet, thought they could go into business together. Mr. McVicar Sr. had worked at Seattle Hardware in the 1920s and thought he and his son could make a go of a hardware store. Mr. McVicar Sr. searched until he found the not-yet-completed commercial building being built by Mr. Hansen at 8501 35th Ave NE. With new houses going up all around, it seemed an ideal location for a new business. “McVicar & Son” leased two sections of the building and opened their hardware store in 1946. 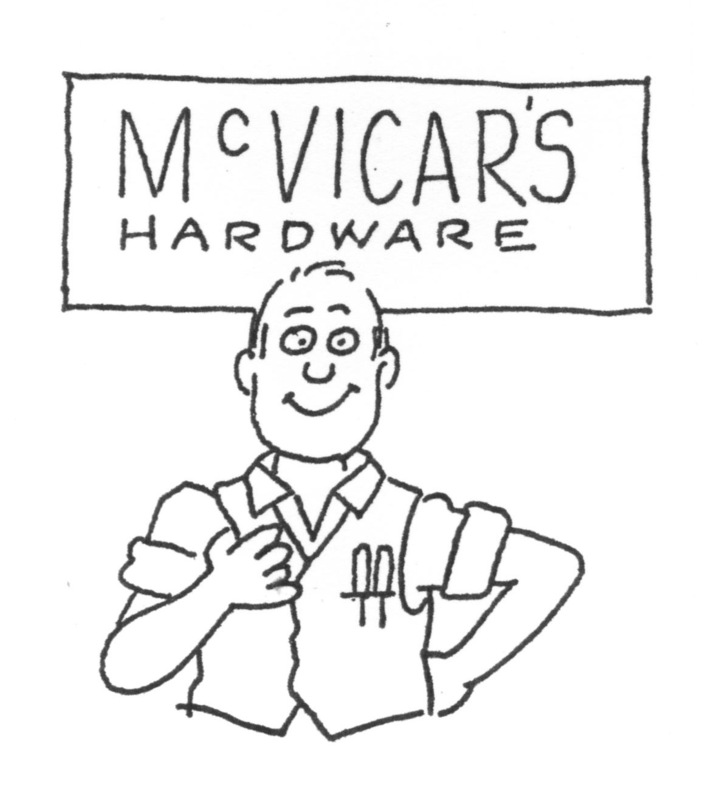 Grant McVicar, drawn by Bob Cram for the Wedgwood community newsletter of November 1992. All rights reserved; do not copy without permission. At first the McVicars had trouble finding merchandise to sell, because it took several years for industries to retool from wartime production to the manufacture of consumer goods. McVicar’s stock often consisted of only one or two of each item. If an item sold they would search other stores and wholesalers to replace it. They even tried making things to sell, such as hot plates made out of scrap metal obtained from Boeing. As consumer goods became more available, Grant McVicar became adept at anticipating the needs of his customers. Lawn and garden supplies were especially popular with young families who were putting in yards around their new homes in Wedgwood. Gifts and specialty foods were also popular: the McVicar store had a Gourmet Shop which sold everything from champagne-cured sauerkraut to chocolate-covered ants. Grant McVicar realized that neighborhood women would be drawn into the store by the availability of food products and housewares, so he set up this department staffed by a woman, Carole Ann Marcy. Part of Ms. Marcy’s job was to put together gift baskets. These would contain food specialty items such as cheese, tea, jams and sauces, in a wicker basket wrapped with cellophane and ribbon. First offered at Christmastime, the baskets continued to sell well all year as housewarming or hostess gifts. Grant McVicar did not restrict his store only to the “hardware” category if he could think of other product offerings. For about ten years McVicar was the only hardware store in Washington State which was licensed to sell wine and beer. The store even rented out ski equipment. Athletic equipment for sale included basketballs, which parents might want for gifts to their children. Grant got the idea of having evening events at which the store would close at the regular time and then re-open, called a Moonlight Sale from 9 to 11:30 PM, first begun during the Christmas shopping season. The McVicar Hardware store was one of the first in the neighborhood to remain open on Sundays, which also started during the Christmas season. In that era most Wedgwood stores, even groceries, were closed on Sunday, but with competition they soon began staying open on Sundays as McVicar’s was doing. McVicar Hardware and the Wedgwood Tavern were not always “good neighbors.” Up until 1968, 35th Ave NE was a two-lane arterial with angle-in parking in front of the commercial buildings. On at least one occasion a late-night tavern customer put his car into the wrong gear while trying to get out of a parking space, and drove into the display windows of McVicar Hardware. One of the most fondly-remembered Wedgwood community activities of early years is the annual Halloween store-window painting contest. The idea was born on Halloween of 1952. In the early evening some rambunctious lads began soaping up the McVicar Hardware store windows. Mr. McVicar intervened and tried to channel their energy by giving each of them a small can of poster paint and a brush, allowing them to paint up the store windows properly for Halloween. A 1958 artist at work on her Halloween window painting in Wedgwood. Photo from the November 1858 community newsletter. This incident gave Mr. McVicar the idea of a store promotion and community activity. The next year at Halloween, he painted white squares on his store windows, invited neighborhood children and offered prizes for the best paintings in different age groups. The response was so overwhelming that customers in the store had to pitch in to help distribute paint palettes and hand out ice cream cones to participants. In following years the painting contest expanded to the windows of eighteen Wedgwood businesses with as many as 700 children coming out. The organizing of the annual contest was shared by the Community Club, the Chamber of Commerce, Boy Scouts and Camp Fire leaders, a tribute to Grant McVicar’s ability to bring people together for Wedgwood activities. 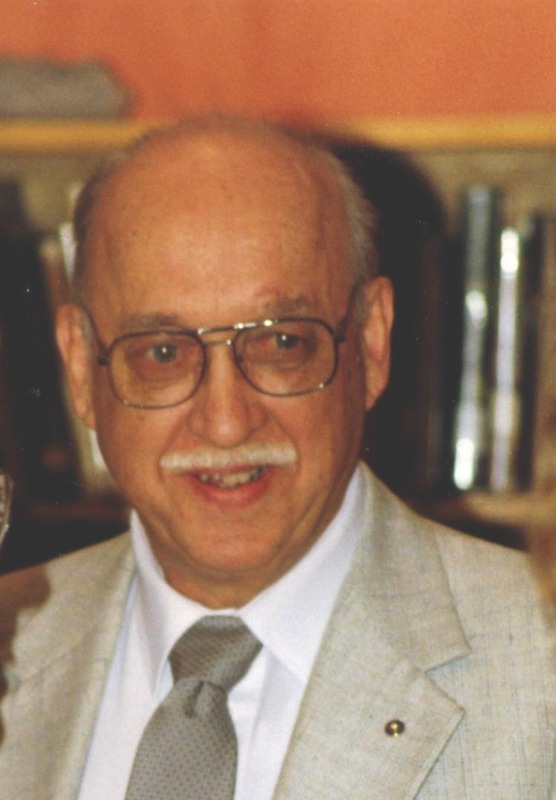 In March 1992 Mr. McVicar spoke in classrooms at Wedgwood Elementary School as part of a local-history project. Along with operating a successful business, Grant McVicar had a concern for the development of the Wedgwood community. He helped found the Chamber of Commerce and served as its first president. He was influential in neighborhood issues such as the post office. He made the first contact with post office officials as he felt it would be an asset to have a post office in Wedgwood. “People are more important than profit” was Grant McVicar’s working philosophy. His concern for the community had a great effect on the development of the Wedgwood neighborhood as we know it today. This article is based upon interviews with Grant McVicar in 1992. This entry was posted in businesses, name of the neighborhood and tagged Chamber of Commerce, Halloween, hardware store, Neighborhood History, post office, Seattle, Wedgwood Ale house building. Bookmark the permalink. I remember McVicars being a very cool store. Sure they had hardware but all kinds of other merchandise too. They had model airplanes and they had a 1/32 scale British Spitfire that remained uncomfortably out of my price range until someone else bought it. When did E become NE? As in E 86th St to NE 86th St. I remember the change but not the year.